This one day class is designed for SharePoint team members and end users who need to know how to use the team collaboration, document management and social features of Microsoft SharePoint 2016. This class features live inline interactive labs where the student interacts with both SharePoint and other students. Explain the core SharePoint feature sets. Explain the primary uses of SharePoint. Know that SharePoint content is security trimmed. Navigate SharePoint sites, lists and libraries. Customize Language and Region settings. Explore Libraries and Office Online. Work with the Co-authoring features of Excel. Work with Checked Out Files. Create New Documents with Office Online and Work with Content Approval. Understand the role and uses of SharePoint lists, both out of the box and custom. Add, edit and delete list items. Use Tasks lists in a team project. Create and work with Calendar Events. 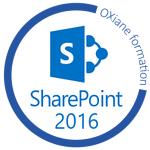 Synchronize SharePoint Task Lists and Calendars to Outlook. Know what SharePoint Search can Index and Retrieve. Perform keyword and property searches. Describe and use the SharePoint social features. Find and use the Newsfeed page. Use Microblogging, including mentions and hash tags. Follow sites, documents, people and hash tags. Use OneDrive for Business to store and share documents. Sync OneDrive for Business to a local device.